We awoke the next morning keenly aware that we had lollygagged pretty badly the day before, and we had some lost ground to make up. 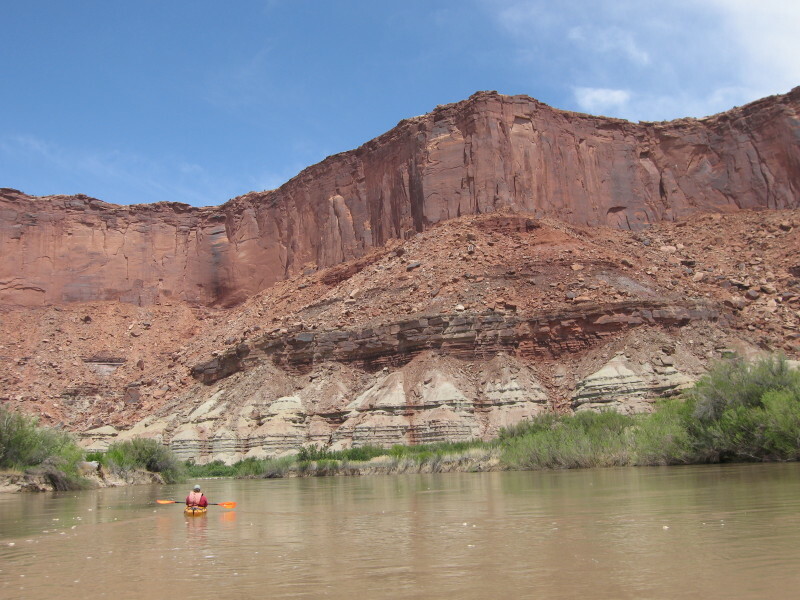 We loaded up the boats and paddled out Horsethief canyon and to the main current. This time we actually used our paddles, which certainly got us moving a bit faster. Of course, we didn’t go that far before we had to land and do some more exploring. At a large bend in the river was an old cabin, inhabited a century ago by some lonely soul. After checking it out, we enjoyed the steep climb to a tall rock rib a few hundred feet above the cabin, crowned with an old Native American ruin. The view for miles up and down the river inspired us to return to the boats and continue the paddle. It was several miles around the bend and down a long straight section before the river again began to twist and turn. More interesting to me is that the Moenkopi layer gave way to the white sandstone of the White Rim formation. 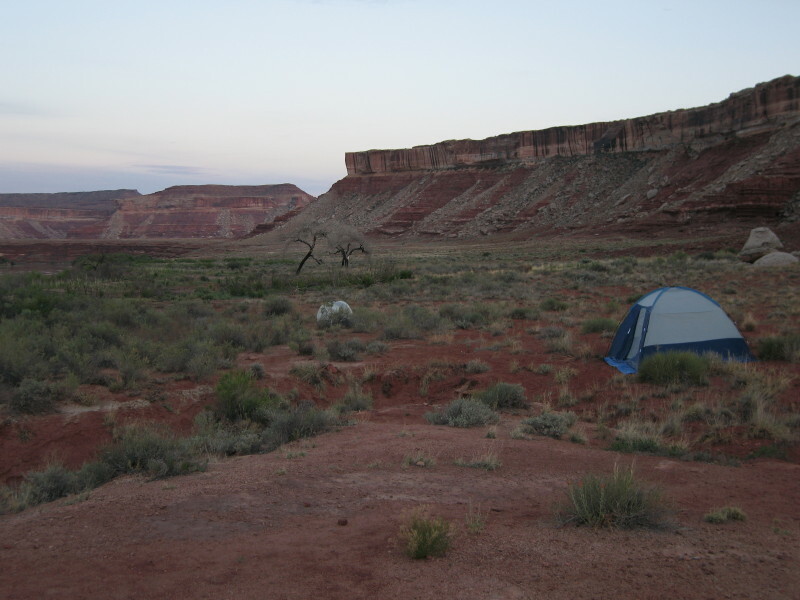 This formation has formed a large flat plateau in the Island in the Sky district of Canyonlands, and is traversed by the famous White Rim road. From our perspective at river level, sheer white cliffs rose out of the banks of the river- at first only a few feet high, but eventually towering overhead. (Incidentally, Canyonlands National Park has an outstanding Interactive Geologic Atlas available on the web). 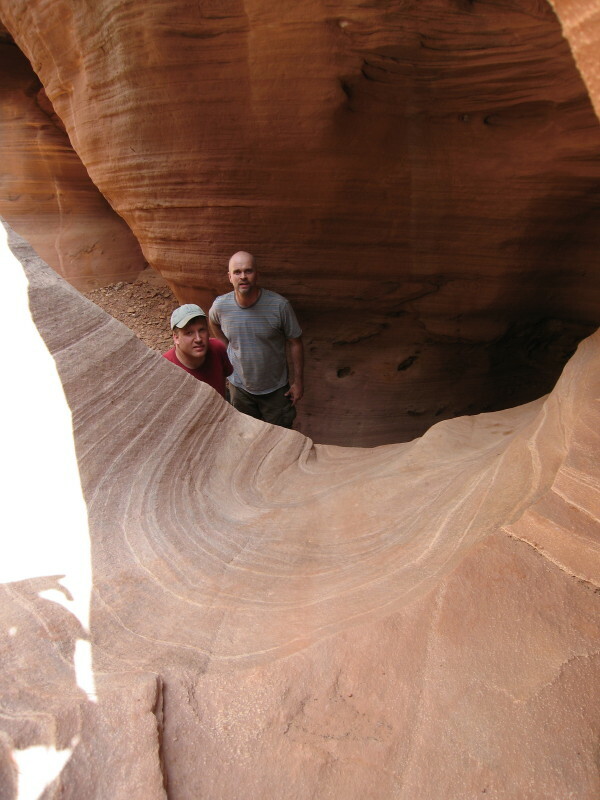 The White Rim formation is very resistant, but comparatively not very thick, and we soon reached the Organ Rock Shale, a very layer of red mudstone, sandstone, and shale. Our river descent took us to Anderson Bottom, an abandoned meander. 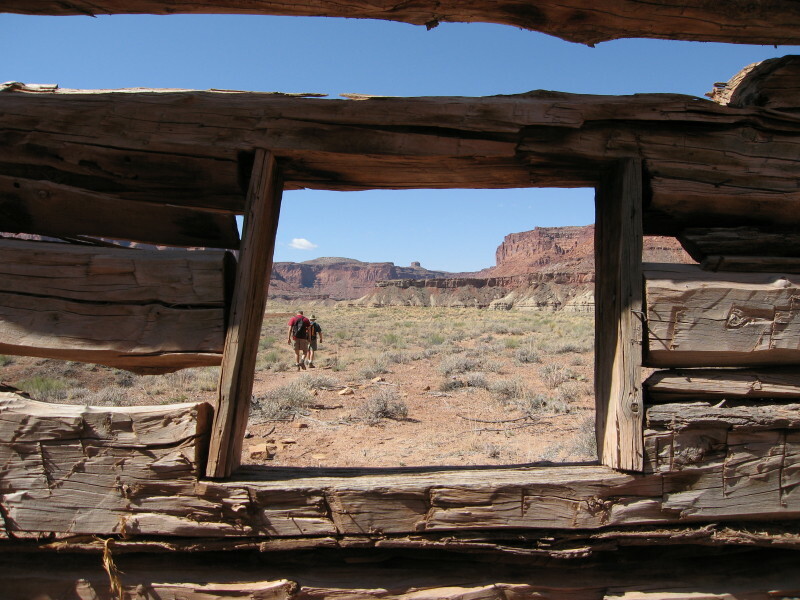 An abandoned meander, also called a Rincon, is originally formed by a loop in the canyon. Over the millennium, the river gradually cuts away at the inside edges of the loop, until it eventually breaks through. 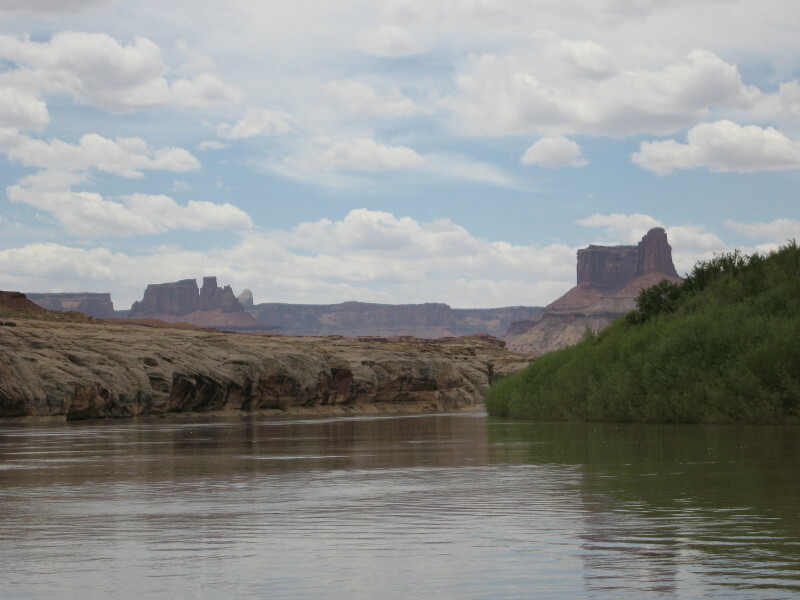 At that point, the river takes the shortcut, and a curved section of canyon is left high and dry. This one had some secrets awaiting for us. 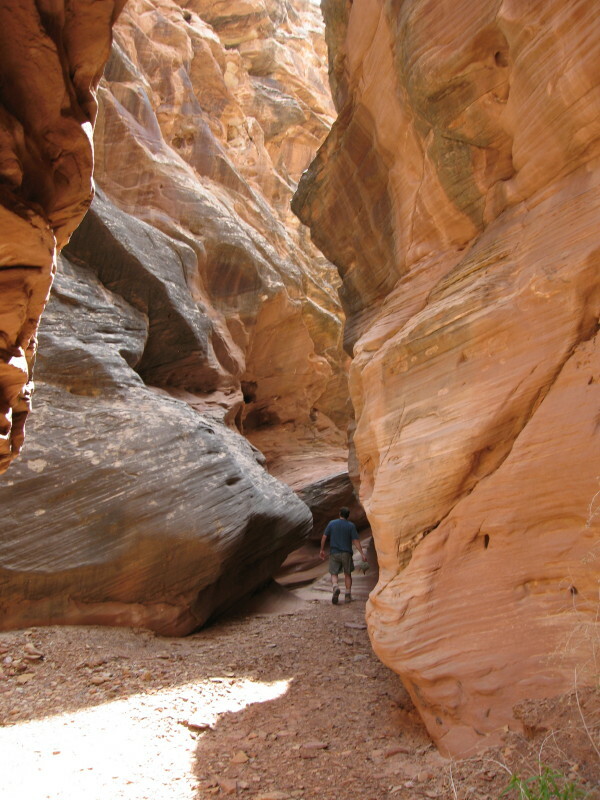 We had heard of a slot canyon up this meander, so we started on a long hot walk across the dusty red sand. It was pretty much a slog, but we could see ourselves getting closer to a side canyon up ahead. As we went up the side canyon, we again met our friend the White Rim sandstone. A less resistant rock layer would have created a wide side canyon, but this was hardier rock, and the canyon was correspondingly smaller. Much smaller. You could reach out with your arms and touch the sides. At one point we hit a pour-off and we were stopped in our tracks. We tried a lot of different ways to climb up, but eventually had to settle for the “human ladder” approach of linking hands and forming a foothold for the others. Past the pour off the canyon narrowed even more. We were forced to retreat when we hit a second pour-off, but it was definitely worth the side trip. The canyon had still more secrets awaiting us. 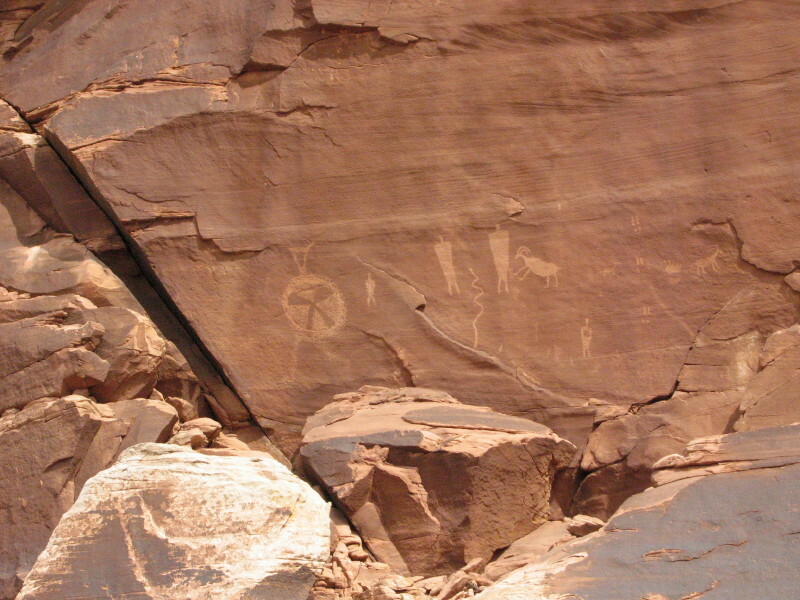 Dave and I did another short hike and found a collection of petroglyphs. Back at the river, we added a few more miles, finding a very nice campsite on a bench above the river. We ended the day with grilled steak and potatoes, plus the obligatory whiskey.